An app to make people feel valued. [nīt.kaan. means: purposefully] Create spontaneous, thoughtful, positive notes they'll hold on to. Our lives are measured by the lives we touch. 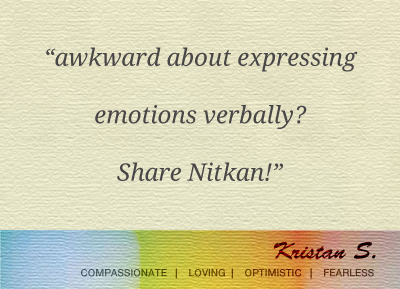 Share Nitkan to encourage the good in others. 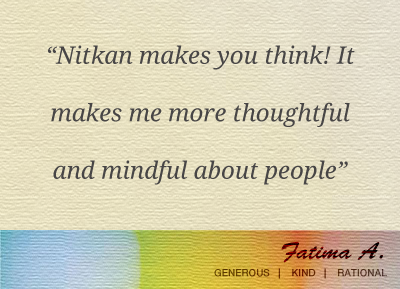 Nitkan helps you focus on your most important people and share messages they'll want to hold on to. It's a private, positivity sharing app for the people you know and interact with in your professional and personal life. Tell a colleague how awesome they are. Tell your partner about the small stuff you love about them. Tell your friend how generous they are. Make someone's day - simply, because you can. Generous. Kind. Giver. Leader. Are some of the things the people on Nitkan are called. Nitkan is not a 'social network'. 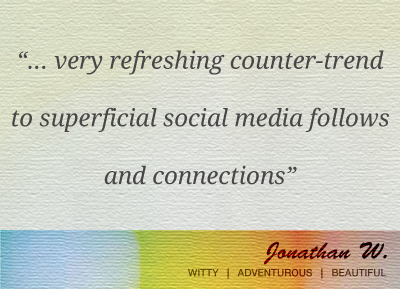 Meaningful private interactions fuel your experience. There are no followers. Or click-based connections. People are connected only when you exchange something personal & thoughtful. True generosity doesn't need an audience. Nitkan defaults to 'private' for every interaction. We require that people seek permission to show your personal note on their public profile. The Nitkan Circle shows your impact on others. It's made of all the people connected to you via Nitkan. And comes alive to show where you focus. Share more offline and through the app to see how you are making a difference. Eulogy Values are greater than resume values. You are a person with a great heart, sharp intellect and strong spirit. Why limit yourself online to temporary titles, number of followers and likes? You are more than what you do, where you work and how much you earn today. At Nitkan, we are shining the light on the truly nice guys. Copyright © 2015 Nitkan, Inc.
Like most website and app operators, Nitkan collects non-personally-identifying information of the sort that web browsers and servers typically make available, such as the browser type, language preference, referring site, and the date and time of each visitor request. Nitkan’s purpose in collecting non-personally identifying information is to better understand how Nitkan’s visitors and customers use its products. From time to time, Nitkan may release non-personally-identifying information in the aggregate, e.g., by publishing a report on trends in the usage of its services. Certain users or visitors of Nitkan choose to interact with Nitkan in ways that require Nitkan to gather personally-identifying information. The amount and type of information that Nitkan gathers depends on the nature of the interaction. For example, we ask customers who sign up for an account within the Nitkan mobile applications to provide an email address. In each case, Nitkan collects such information only insofar as is necessary or appropriate to fulfill the purpose of the user’s interaction with Nitkan. Nitkan does not disclose personally-identifying information other than as described below. And visitors can always refuse to supply personally-identifying information, with the caveat that it may prevent them from engaging in certain website-related activities. Nitkan may collect statistics about the behavior of visitors to its websites and users of its iOS application. For instance, Nitkan will monitor usage of product features so that we can further improve user experience for our users. Nitkan may anonymize and display this information publicly or provide it to others. However, Nitkan does not disclose personally-identifying information other than as described below. Nitkan discloses potentially personally-identifying and personally-identifying information only to those of its employees, contractors and affiliated organizations that (i) need to know that information in order to process it on Nitkan’s behalf or to provide services available on Nitkan, and (ii) that have agreed not to disclose it to others. Some of those employees, contractors and affiliated organizations may be located outside of your home country; by using Nitkan, you consent to the transfer of such information to them. Nitkan will not rent or sell potentially personally-identifying and personally-identifying information to anyone. Other than to its employees, contractors and affiliated organizations, as described above, Nitkan discloses potentially personally-identifying and personally-identifying information only when required to do so by law, or when Nitkan believes in good faith that disclosure is reasonably necessary to protect the property or rights of Nitkan, third parties or the public at large. If you have supplied your email address, Nitkan may occasionally send you an email to tell you about new features, solicit your feedback, or just keep you up to date with what’s going on with Nitkan. We primarily use our various blogs and social media accounts to communicate this type of information, so we expect to keep this type of email to a minimum. If you send us a request (for example via a support email or via one of our feedback mechanisms), we reserve the right to publish it in order to help us clarify or respond to your request or to help us support other users. Nitkan takes all measures reasonably necessary to protect against the unauthorized access, use, alteration or destruction of potentially personally-identifying and personally-identifying information. Nitkan is not directed to children under 13. If you learn that your minor child has provided us with personal information without your consent, please contact us.